Purlfrost's Neutral Tinted Window Film is designed to ward off excess sunlight, glare and heat emanating from the sun. A very efficient and smart looking low reflectivity tinted neutral film range for glass. Purlfrost's Neutral tinted film comes in 3 grades, can be applied to most glass surfaces and the effects will be immediate. Tinted window film has for long been the chosen solar control option for commercial buildings, due to its smart appearance and exceptional heat and glare reduction properties. This film is often specified to reduce the amount of visible light and glare which can affect staff working on computers, and cause headaches and loss of productivity. This film can also be used in a residential setting and is ideal for conservatories where excess heat and glare can be an issue. How does tinted film works? The clue is in the name. The film's tint reduces excess sunlight by making the glass darker. 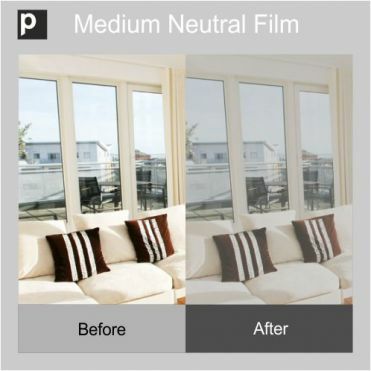 Our Neutral films come with a 10 year warranty, but they will last much longer. How is Neutral window film manufactured? The film is made of several layers of very thin materials, including a metalised costing to reduce excess heat. This is what makes residential and commercial films different to car tints, as car tints are usually just dyed films.